All natural cheese. 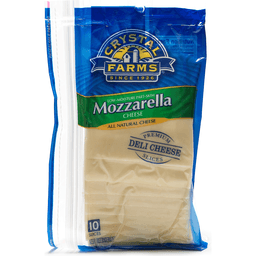 Zip Pak resealable. Since 1926. 8 cups approx. Thank you for choosing Crystal Farms. 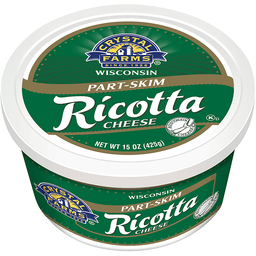 Providing you and your family with a great tasting cheese at a great value has been our commitment since 1926. 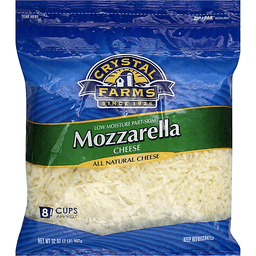 Find more great recipes at crystalfarmscheese.com. Your comments welcomed 1-800-672-8260. Excellent source of calcium. 20% DV in 30 g. Product of USA. Low-moisture part-skim. Since 1926. All natural cheese. Premium deli cheese slices. Resealable package. Good source of calcium. Thank you for choosing Crystal Farms. 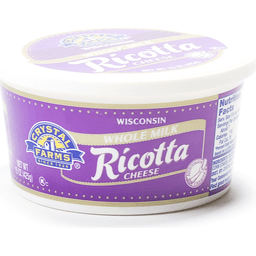 Providing you and your family with great tasting cheese at a great value has been our commitment since 1926. Your comments welcomed 1-800-672-8260. 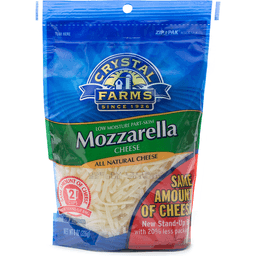 Find great recipes at crystalfarms.com. Product of USA. 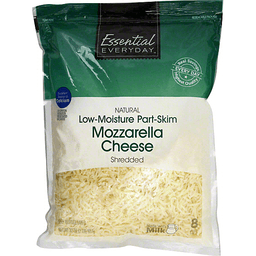 Per 1 Oz: 90 calories; 3.5 g sat fat (16% DV); 210 mg sodium (9% DV); 0 g total sugars. 100% quality guaranteed. Like it or let us make it right. That's our quality promise. essentialeveryday.com. Low-moisture part-skim. 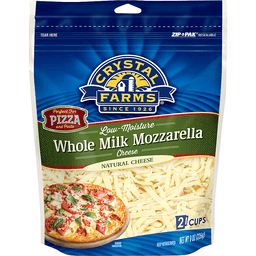 Per 1/4 Cup: 80 calories; 3 g sat fat (16% DV); 190 mg sodium (8% DV); less than 1 g total sugars. Resealable. 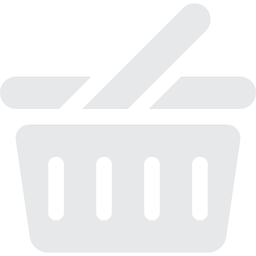 Great products at a price youll love - thats Essential Everyday. Our goal is to provide the products your family wants, at a substantial savings versus comparable brands. Were so confident that youll love Essential Everyday, we stand behind our products with a 100% satisfaction guarantee. For recipes, visit www.essentialeveryday.com. 100% quality guaranteed. Like it or let us make it right. Thats our quality promise. 877-932-7948; essentialeveryday.com. 10 slices. 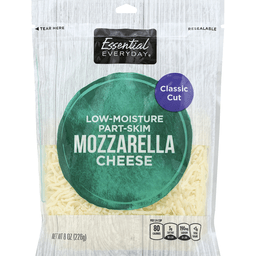 Per 1 Slice: 70 calories; 2.5 g sat fat (13% DV); 150 mg sodium (7% DV); 0 g total sugars. Best if used by date on package. 100% quality guaranteed. Like it or let us make it right. Thats our quality promise. essentialeveryday.com. 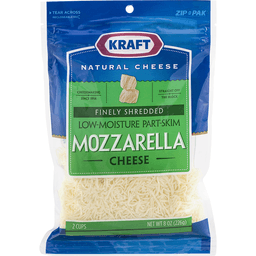 Kraft Finely Shredded Mozzarella Cheese. Low-moisture part-skim. 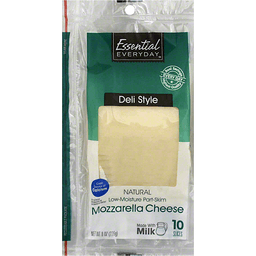 Natural cheese. Cheesemaking since 1914. Straight off the block. Recloseable. Zip Pak®. 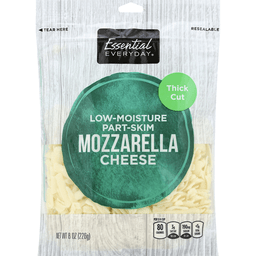 Nutrition information per serving: 240 calories, 9g total fat, 4.5g saturated fat, 530mg sodium, 27g carbohydrate, 13g protein. 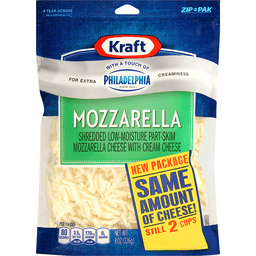 kraftfoods.com. 1-800-634-1984, have package available. 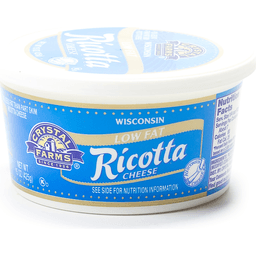 Contains 0g of lactose per serving. Zip-Pak®, the Zip-Pak Logo® and the Color Line Design® are registered trademarks of ITW. 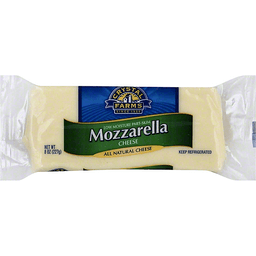 ©Kraft Foods. 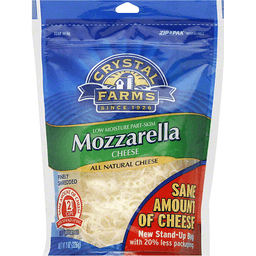 Crystal Farms Whole Milk Mozzarella Shreds, 8 oz. Approx. 2 cups. Melts & stretches. Award winning original product. Deliciously dairy free. Dairy, lactose and casein free. Gluten and soy free. Cholesterol free. 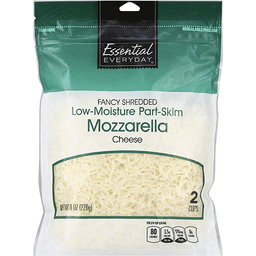 Per 1/4 Cup (28 g) Serving: 0 soy free; 0 mg cholesterol; 0 g trans fat; 90 calories. Resealable pouch. 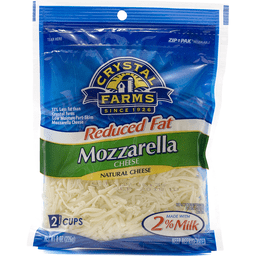 A Great Alternative: Daiya Mozzarella Style Shreds are a delicious alternative that you can enjoy on pizza, lasagna, nachos, quesadillas or any of your favorite meals. 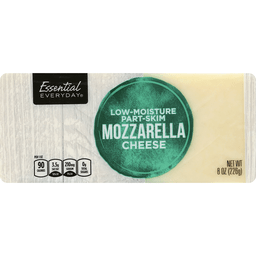 Get the irresistible taste, melt, and stretch you love without any dairy (including casein and lactose), soy, gluten or other common allergens. 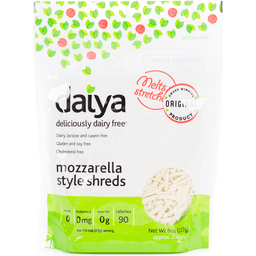 Daiya Mozzarella Style Shreds are 100% free of preservatives and with 0 mg cholesterol and 0 g trans fats, Daiya brand products can help you and your family look and feel your best! Thanks for choosing Daiya and don't forget to check out the great recipes on our website at www.daiyafoods.com/recipes. Made in a plant free of animal ingredients, milk, egg, soy, peanuts and tree nuts (excluding coconut). Vegan. Questions and comments? 1 (877) 324 9211; www.daiyafoods.com.